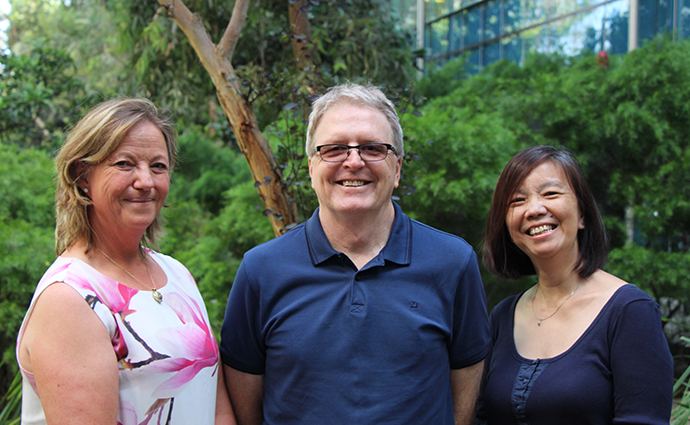 L-R: Dr Tracey Gaspari, Professor Rob Widdop and Associate Professor Siew Chai. The company has been founded to develop therapies to address fibrosis, a condition associated with many chronic diseases where tissue damage leads to scarring and a loss of organ function. Inosi recognises the importance of close and early engagement between academic researchers and industry partners to ensure new therapy development programs are informed and aligned with addressing unmet patient and market needs. Inosi’s technology is based on collaborative research from a team at Monash University led by Associate Professor Siew Chai, Dr Tracey Gaspari, Professor Robert Widdop from the Monash Biomedicine Discovery Institute and Professor Philip Thompson from the Monash Institute of Pharmaceutical Sciences, with Monash Innovation leading the deal. The drug development program originated from a collaboration with St Vincent’s Institute of Medical Research and the Florey Institute of Neuroscience and Mental Health, both University of Melbourne affiliates, and since progressed with the fibrosis group at Monash. “Fibrosis is closely associated with tissue injury and scarring that occurs with chronic diseases and is responsible for a large proportion of healthcare costs and mortality in developed countries, which is only projected to increase as the population ages,” Associate Professor Siew Chai said. “There is a huge unmet need for therapies that can prevent or reverse fibrosis to modify disease progression, and we are excited to be advancing our work one step further towards improving the lives of patients,” Professor Robert Widdop said. “BioCurate is delighted to be investing alongside IP Group. This is a great example of new approaches and models that are translating research at Australia’s leading universities into products with the potential to improve lives,” Dr C. Glenn Begley, CEO of BioCurate, said. “Inosi Therapeutics is a great example of the quality technology from university research that IP Group specialises in backing. We’re delighted to have made this investment and look forward to working with BioCurate and the team to develop these therapies towards the clinic,” Michael Molinari, Managing Director of IP Group Australia, said. “This is Monash’s first investment with IP Group, and combined with investment from our strategic partner BioCurate, this is a tremendous boost to the program, providing funding and expertise to rapidly translate our research outcomes into much needed new treatments,” Dr Alastair Hick, Senior Director Monash Innovation said. This media release was originally published by BioCurate.